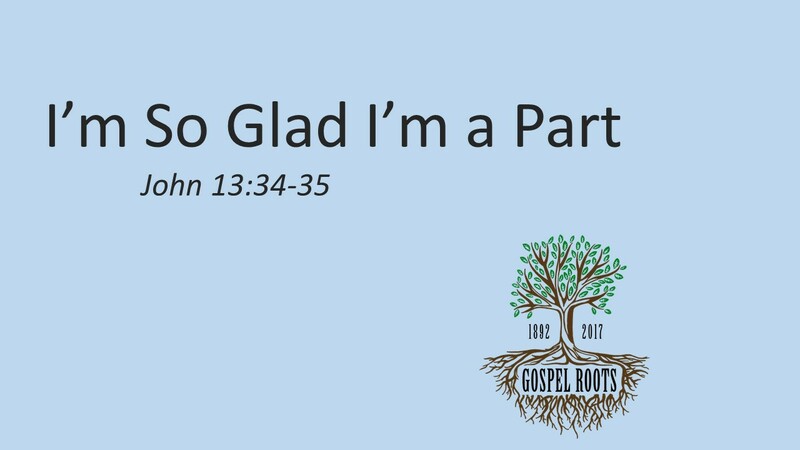 [Matt's Messages] "I'm So Glad I'm a Part"
We’re going to take another short break from our study of Galatians to return to our reoccurring sermon series that celebrates our 125th anniversary as a church. 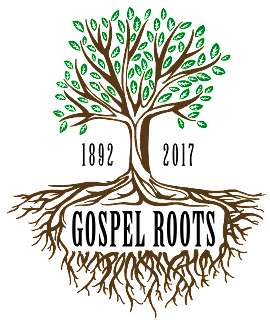 We call these messages, “Gospel Roots.” Where we return to the foundational values and principles that have shaped our church family for the last 125 years, and we hope will shape us until the Lord returns. Each month, we’ve looked at a different facet of our church’s life over the last one and a quarter centuries: The gospel itself–Jesus Christ and Him Crucified. Singing the gospel in worship. Sharing the gospel in evangelism. Being devoted to prayer. 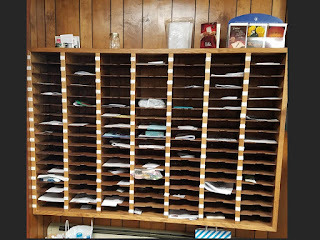 Being devoted to the Scriptures: “Where stands it written?” And, last time, being devoted to the Great Commission–sending those people whose pictures are on our fridges to take the gospel to the whole globe. Well, today, I want to talk about another important set of people. And they might be on your fridge. But they aren’t far away. In fact, they are right here in this room today. When you saw the sermon title this morning, I hope you broke out in song (at least in your head). Bill and Gloria Gaither wrote that song about 47 years ago. Our hymnal only has the chorus, anybody know how the first verse goes? Today I want to talk about loving one another as a church family. Loving one another as a church family. We accomplish our shared mission by sharing life with one another community. The church is all about people. It’s all about relationships. It’s all about loving one another. Just like Jesus told us to. Do you have John chapter 13 in front of you? John 13 is the night before the Cross. Jesus is in the upper room with his disciples, and He’s just told them that He is going away, and they cannot come with Him. But He is going to leave them with some instructions. Some very important instructions. John 13:34. So what do you think is in the mystery box today? For each of these Gospel Roots messages, we’ve had at least one artifact that focuses our mind on an aspect of our church’s history. Today, I have all of the church family directories since I became the pastor here in 1998. Maybe somebody’s kept all the ones before that, but I haven’t. This is the one you sent to me when I was candidating to be your pastor almost 20 years ago. Under Pastor, it was blank, and so I wrote my name in when I got here. It’s all marked up. There are little notes for me to figure out who everybody is. I added cell phone numbers as I picked them. I had to write in some names that weren’t here until about half-way through the year. Their names are included in this one from 1999! I have 2 for 2000. This one with a snazzy cover drawn by my wife. It’s got little logos for worship, instruction, fellowship, evangelism, and service. My copy is just falling apart from using it so much that year. And then we did a photo directory later in 2000. It’s got baby Robin in the front of it. Awww. A lot of people in there. We don’t use these as much any more because most people have their “contacts” saved on their phones. We aren’t as dependent on a directory, as long as we have the correct information, like Vera’s new phone number. Here’s another artifact that gets at what I’m talking about. These photos may not be on your fridge, but they are on the wall out there outside of my office. Since 1999, we’ve taken a church family photo once a year. And this October, we’re going to take 2017 at our special event the first weekend in October. And we want all of you to be here and be in that picture! The faces change. Some come and go. But the point is that we are a family. There are lots more pictures than that, of course, of our church family. I’m sure we’re going to put a bunch of them out in October. Think about all of the precious people that have been a part of our church family since 1892! Here’s one from the third decade of our church’s life. 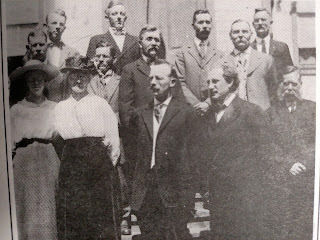 From left to right: Esther Leafgren, Mrs. Rudberg, Henry Nelson, Rev. 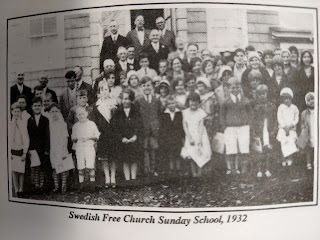 Lundmark, Lard Danielson (a founding member), Andrew Leafgren, Charles Dahlgren, Gust Nelson (a founding member), Walfrid Johnson, Oscar Nelson, Axel Nelson, Sameul Emanuelson, Charles Freeman. 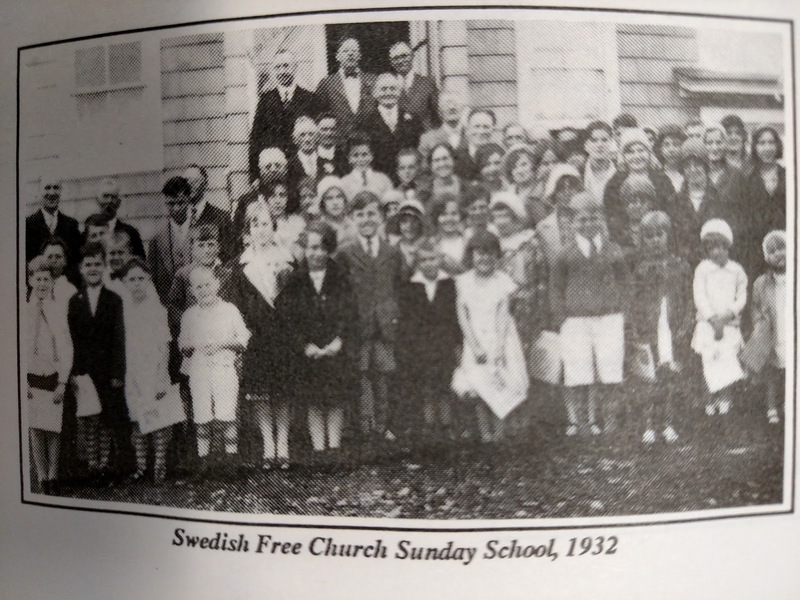 Here’s the whole Sunday School in 1932. I’m so glad I’m a part of the family of God! And we are joined together to each other as a family. Ephesians 3: “I kneel before the Father, from whom his whole family in heaven and on earth derives its name” (vv.14-15). 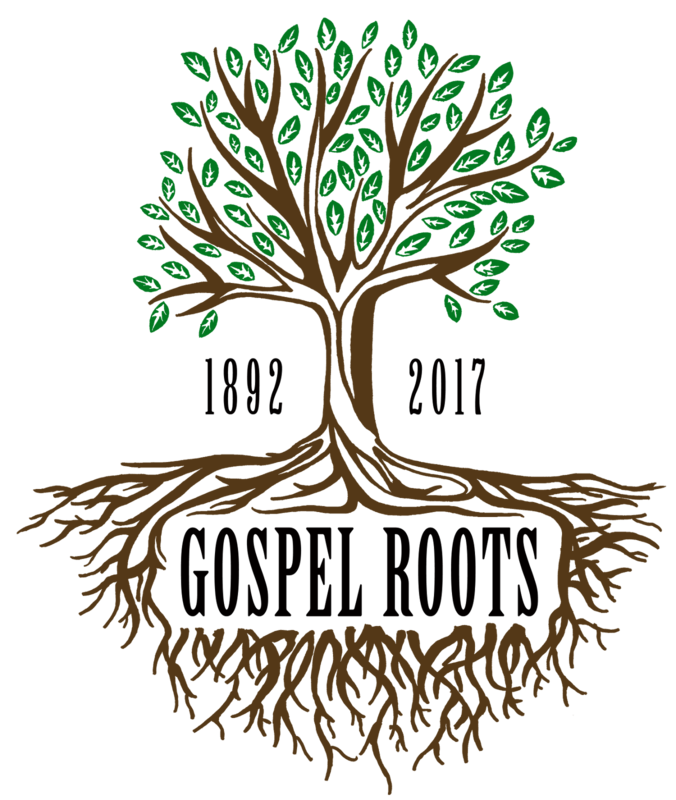 The Bible uses many metaphors to describe God’s people, God’s community. The Body of Christ. The Bride of Christ. But also, the Family of God. And how often does the New Testament talk about the brothers and sisters in Christ? Over and over and over again. The disciples of Jesus Christ were to envision themselves as part of a new community a new family brought together by our elder brother, Jesus Christ. Not just adopted, not just given a new birth to our heavenly Father, but included into a new family and joined to each other. Joint-heirs with Jesus. That’s Romans 8:17, co-heirs with Christ. And he tells them that he’s going away. And when the parent goes away, what does he tell his children that he’s leaving behind? Behave yourself, right? And specifically what do you tell your kids to do with each other while you’re away? Get along, right? #1. WE LOVE EACH OTHER AS JESUS COMMANDED US. As a church family, we love each other because Jesus told us to. If anyone asked you what the pastor said today, tell them the message was simple. Look around the room right now. These are the people that Jesus is telling you to love right here in John 13:34. Tell somebody that you love them, right now. People might come to our church because of the preaching or because of the music or because of the great children’s programs. But they stay because of the love of a church family. I have been feeling pretty down about Jossy going to the nursery at church, knowing that it is for ages three and under. I didn't want her going there just because she is unique and may not seem older than three. It made my heart sad. It can be difficult being a parent of a special needs child and figuring out how to best "fit in." We are so, so proud of her and how far she has come, but sometimes there are blaring moments of feeling sadness and defeat. Nursery versus children's church versus not going to church at all and avoiding the decision completely has been one of those blaring moments for me. I know that this sounds silly and ridiculous, but this was a complete reality for me. 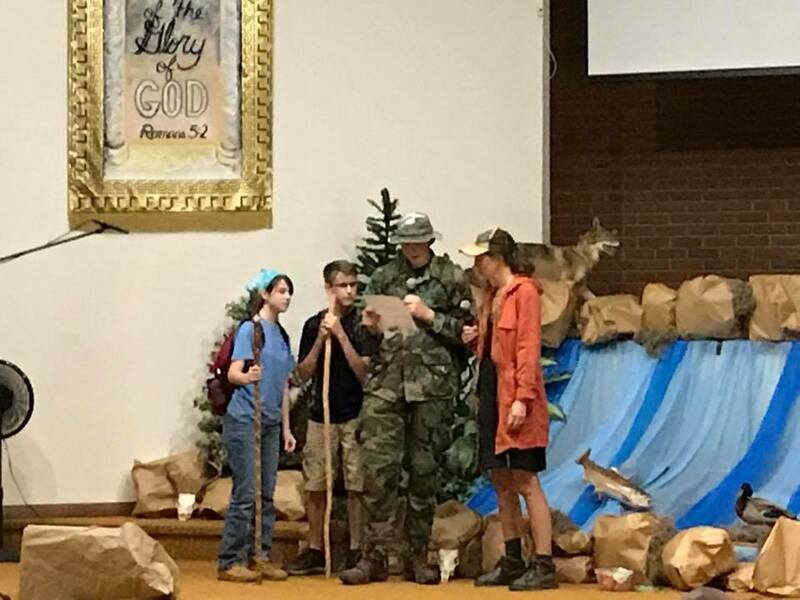 Two weeks ago, it was Family Bible Week at our church. We decided to try Jossy in a class this year. To my amazement, she did fabulous (I knew in my heart she would). Today, was an even bigger milestone, she attended children's church with same age peers and she did amazing again. I am so, so thankful to be a part of such a wonderful church. My fears were immediately relieved when she came out of class today happy. Every single person in our church is supportive, encouraging, and willing to walk on this journey with us. I am thankful that God has provided us with this church family and a place that I feel safe and comfortable to venture out more on this journey. Today, I was able to listen and absorb the message. For the first time in a long time, I didn't feel scared or sad about what was happening. My mind was in the right place. I was content and my heart was happy. I have known for the past four years that this journey was given to us for a purpose, a reason. Whether it is to teach me, my family, or others something, there is a reason. I know many things along the way have been part of His plan, today was part of His plan. I am thankful that my heart is still moldable and willing and able to be changed. I am so very, very blessed. We love each other as Jesus commanded us. We care for one another and try to meet each other needs. Here’s another item for you that speaks about this church. 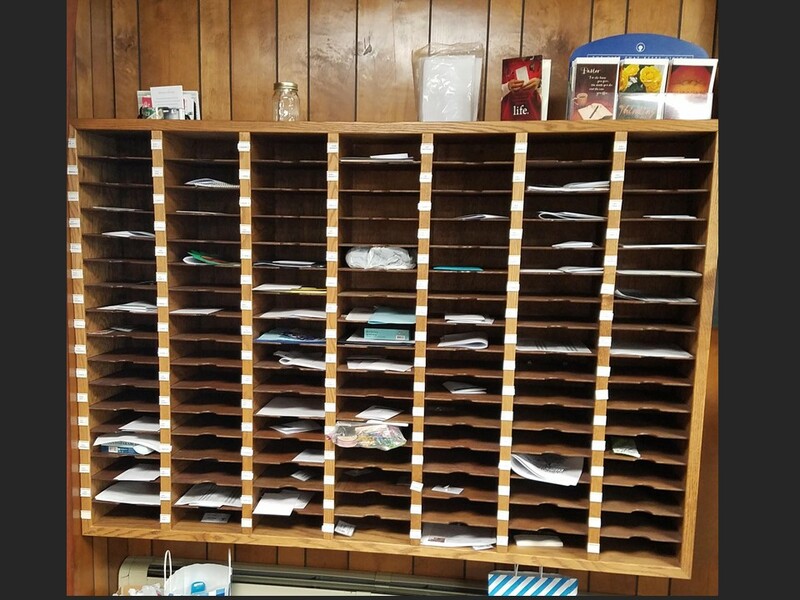 I love the mailboxes back there in the foyer. We want everybody to have one. Write each other notes! Put cards in each other’s boxes. Tell people that you’re thinking about them. And my favorite thing about those mailboxes is when they have one of these on them. This is a casserole dish! It is not a historical one. It’s just one from the kitchen back there. I love it when the mailboxes are covered with these. It’s because you’ve been loving on each other! Somebody was in the hospital and you made a meal. You brought a dish to a church family meal and meeting. You made a dessert for Family Bible Week or a funeral luncheon like we had this week. These are signs of family life. I love it when our church building gets that run-down lived in look. Like a living room. Cindy might not like it, but it says to me that we have come together. Thank you, hospitality team, for making and serving all of those years. 125 years of church family meals! That’s a lot of deviled eggs! Thank you, Coffee Ministry team, for the last few years of serving us after church each week. I love to see people hanging around and talking after church! Thank you, Deaconnesses, for leading the charge to take meals to people in their homes. When our first child died a stillbirth in April of 1999, there was a steady stream for like two weeks where a different family showed up on our doorstep with a dish like this. We were so sad and sorrowful. But you were there and you brought us food. You didn’t know everybody brought the same thing. It made us laugh. I now I can’t eat stuffed shells without feeling loved by you. How many people here can tell a story about how this church family was their family? Our Link Groups function like that. Our Sunday School Classes have. Our various prayer groups during the years. We love each other as Jesus commanded us to. Now, let me ask you a question. Is that easy to do? Sometimes it is. Sometimes it’s easy to love. But often it’s very hard to love others. This room is full of sinners. Our entire church family is made up of sinners! And sinners can be pretty hard to love at times. Do you know 1 Corinthians 13? The love chapter? “Love is patient, love is kind,” and so on. Do you know why Paul wrote that? It’s because the church at Corinth could not get along! They had to be reminded what love looked like! 1 Corinthians 13 sounds great when it’s read at a wedding, but it’s really hard work. And how many times have we failed to do it? I know that I have failed to love you all many times. There are people who are no longer a part of our church because they felt that I failed to love them. And some of them were right. There faces are on those pictures. I have failed many times. The hardest times that this church family has ever gone through were times of church conflict and even a split or two. Some of you still have emotional scars that hurt from those times. We have not loved each other perfectly. We have not always obeyed this command. We repent and apologize where we know we are wrong. And we forgive, and we release bitterness and we practice patience and long-suffering with each other. And we hope for restored relationships in the future. This love thing is hard, but we know that Jesus commanded us to do it. And we know that Jesus showed us how to do it! #2. WE LOVE EACH OTHER AS JESUS SHOWED US. Do you ever wonder what is new about the new commandment? I don’t think that’s the first time that God’s people were told to love each other! But that’s what Jesus says. I think the key is the next sentence. We have not just a new commandment but a new example. Jesus has just washed their feet. John says that he showed them the full extent of His love. In just a few short hours, they would see love like never before! Jesus was on the way to the Cross. Jesus showed us how it’s done. Yes, it’s hard, but Jesus has shown us again and again the way forward. We don’t love each other because we like each other. I like you guys...most of the time. But the love that this is calling me to do for you is not a natural love that comes from lovability either my lovability or your lovability. This kind of love requires the death of Jesus Christ and the resurrection of Jesus Christ to empower it. And to be the example that shows me how to do it. Our church family is not a family by kinship and DNA. We don’t love each other because we are one race. We aren’t one race. We are multi-ethnic. And I hope we become more multi-ethnic over time. We aren’t one political party. Some of you are Republicans. Some of you are Democrats. Some of you are Green Party. Some of you are Independents. We are all kinds of political stripes. We aren’t one in one category of finances. We aren’t in one school district. We don’t all like the same music. We’re blood family because of the blood of Jesus. We have Jesus Christ in common. We aren’t “blood,” but we have “The Blood” in common. And that’s why love each other. Because Jesus loved us first. And He tells us to love each other as he loved us. We were lovely? Were we lovable? No. We were stuck in our sin. We were rebels against His glory. We were decidedly not lovable. But He loved us anyway. So next time you are struggling with loving me, and I know you must from time to time, just think, well Jesus loved me. I guess I can try to love Pastor Matt one more time. And you do the same for the person sitting on the other side of church, too. And they’ll do it for you. This is what Paul said to the Colossians. Chapter 3. And you know what that will do? “By this all men will know that you are my disciples, if you love one another." #3. WE LOVE EACH OTHER TO SHOW JESUS TO OTHERS. The gospel empowers our love and it is preached by our love for one another. We love each other to show Jesus to others. Jesus doesn’t say that people will know we are His followers because we said so. 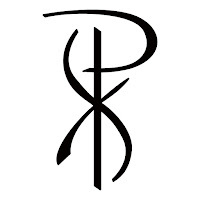 Jesus doesn’t say that people will know we are His followers because we have a bumper sticker with a fish symbol on it. Jesus doesn’t say that people will know we are His followers because we live clean, moral, upstanding, lifestyles. Jesus says like the song Amy Jo played for the offertory, they will know we are Christians by our love. It’s not good enough to just be friendly. It’s not good enough to just say that we love each other, though we need to do lots of that. Because that’s how the world will know that our gospel is truly good news. Here’s something else that new about the new commandment. The stakes are new. They have never been higher. 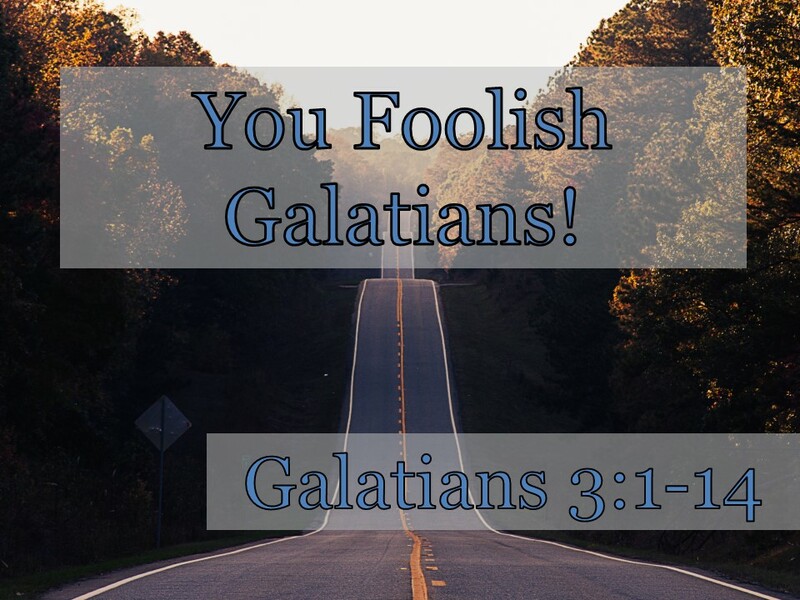 [Matt's Messages] "You Foolish Galatians!" Last time we were in Galatians together, our study culminated in our Hide the Word Verse, Galatians 2:20. That’s the truth of the gospel. Paul says that he lives by faith in Jesus Christ. And he’s been arguing all along that he is justified by faith in Christ and not by doing works of the Law. He’s been preaching grace. And he will not stop. And Paul did not believe that Jesus died for nothing. He believed that Jesus died for his salvation. And for the salvation of the Galatians. Those Gentiles from the region of Galatia to whom Paul had brought the gospel message. The good news of grace in Jesus Christ. But these same Galatians were in danger of losing the good news of grace in Jesus Christ. Some false brothers had infiltrated their ranks, discredited Paul and Paul’s gospel, and had introduced what amounted to a similarly-sounding but actually completely different alternative gospel. A gospel that was Jesus + Doing the Law. Jesus PLUS doing the Law. Yes, Jesus, but not just Jesus. Jesus PLUS. Plus circumcision, plus kosher diet, plus feast days, plus law-keeping, plus law-doing. Nothing wrong with those things in and of themselves, but they are not the gospel. They are not what a Christian should put their hope in. They are not something to rely upon for justification, for being declared righteous. They are not a part of our salvation. So, he’s got to the heart of his message in this letter. The next two whole chapters will be driving this point home. What the gospel of grace really is and why it's better than the false alternatives that are being held out to the Galatians. And he’s going to be urging them to return to the gospel of grace and reject the gospel of grace plus works of the Law. That’s what he’s been up to and that’s what he’s still up to. In chapters 1 and 2, his approach was biographical. He told parts of his story and how they related to the issue at hand. Chapters 3 and 4 are much more theological than biographical. He goes back in Scripture to make and prove his points. But he starts out very personal. Not about his experience, but about their experience. The experience of the Galatians themselves. I can’t get over the tone of Paul in the first 5 verses. Can you? I can’t imagine ever talking that way to a congregation. I should. I should imagine it. This is God’s Word. This was exactly the right thing for Paul to say to these people. And we need to hear it today. But I shy away from confrontation whenever I can. I might not sound like it when I’m up here preaching away, but I can be very fearful around others, even when they are clearly in the wrong. Even when the gospel is at stake. But Paul will have none of it. Paul is bold. Paul is rip-roaring angry. Remember how astonished he was in chapter 1? Well, it’s not over. He’s feeling it now. Righteous indignation. And total concern for these people and for the gospel of grace. There’s an “Oh” there untranslated in the NIV. He’s so furious with them. Have you ever been on the receiving end of a talking-to like this one? When I was a teenager, some of my friends and I were out one night and we decided to play hide and go seek in a cemetery. It’s disrespectful, it’s dangerous–jumping over gravestones and stuff like that. And it was probably illegal, too. We jumped a fence to do it. I don’t remember by whom, I just remember that a car drove up with some adults in it, and they stopped our game and sent us home. And when I got home, I preparing what to say to my parents. Ever think through one of those? And I got their and parents had this look on their faces. They had already heard. The other adults had called them while we drove home. I don’t remember what they said to me. I just remember how I felt. And I know how I would talk to my teens if they came home in the same situation. It might sound a lot like Paul did in Galatians 3. Now, Paul does not fly off the handle. Paul is in control of himself. And the Spirit is, too. And Paul isn’t just venting to feel better because he’s expressed his exasperation. Paul has a purpose for these words. He wants to persuade the Galatians. He wants them to feel the fiery red hotness of his words, but be persuaded by them to return to and to stick to the gospel of grace that he had presented to them. He’s pulling out these rebuking words and dressing them down, not to humiliate them not to just call them on the carpet, but to awaken them from their dangerous slumber and get some gospel sense into them. What are you thinking? Are you under some kind of a spell? What evil influence are you listening to? Paul is saying that he had one message when he was with them and that was Jesus Christ and Him Crucified. He said it again and again. He presented, not Jesus and the Law, but Jesus and His Cross. You know he’s like a parent there, right? How did these get the Spirit? How does anyone get the Spirit? By circumcision? By dietary laws? By being a good Jew? By being a good person? Does anyone get the Spirit of God? By putting your faith in the good news of Jesus. By faith alone in grace alone in Christ alone. Is that what you’re going to do? Is that how this works? Everything you’ve experienced as believers in Jesus, everything good you’ve received like the Spirit of God–that comes from faith. But what about bad things you’ve endured because you’ve trusted Jesus. You used to think it was all worth it. I believe it’s all worth it! But now you’re throwing it away. You see how he wants to wake them up and see what dangerous ground they are on? Observing the law or believing the gospel of grace. Trusting in the your own work or trusting only in the work of Christ. Paul has presented one (that they started with), but they are now in danger of believing the other and rendering everything he’s said as null and void. So, now Paul begins to contrast these two approaches to justification and to tease out some of their implications. “The story of Abraham is on my side,” Paul says. Remember when he did this in Romans 4? How he played the Abraham card? I’m sure that the Judaizers (that’s the name we often give to the false teachers here) loved to talk about Abraham. He was the model of obedience. Remember, how left Ur of the Chaldees and how he was willing to sacrifice Isaac at the command of God? Before he was noted for his obedience, Abraham was noted for what? In fact v.6 is quoting Genesis 15:6 and that happened before Isaac and before circumcision and before the Law! That’s the book of Genesis. Justification (righteousification) is by faith and not be works of the Law. Really? Is that in there in Genesis? Paul says, “Yes!” Verse 8. And it raises all kinds of questions, of course. But the point Paul is making is clear. The blessings of justification come (not by works of the Law) but by faith, trusting in the promises of the gospel. Just like Abraham did. Through having the same faith as you do. Faith eventually placed in your greatest descendant, the Lord Jesus Christ. If we put our faith in Jesus, we get blessed along with Abraham, the man of faith. Sure. If you keep the law perfectly then you will have eternal life. Only one problem: Nobody but Jesus ever kept the law perfectly. And now in the New Covenant, the Law has been fulfilled and doesn’t even sit in the same place it did. We’ll see that next time. So we’re under a curse. He did that for us! Jesus became accursed for us. You see that Spirit there? He’s big in this book. We get Him by faith. Just like we get every one of God’s blessings in Christ. And not by doing the Law. That’s what Paul is trying to drive home. It’s foolish to think that you’ll get all of these blessings by adding circumcision or by adding obedience to the 10 Commandments. If you rely on observing the law, you are under a curse. Rely on Christ. And Christ alone. Because “He redeemed us.” That means He bought us back to set us free. That’s what it means to be redeemed. Bought back to be set free. And we get into that by faith. Let me give you four quick points of application from this passage. Paul’s not done with his argument, but we’ll pick it here next time. Let me suggest four implications and applications from these fourteen verses. #1. START BY FAITH IN CHRIST. If you have you not yet, then I urge you today, to put your faith in Jesus Christ. You see what it’s worth! You see what Jesus did. You see what blessings come for those who trust in Jesus and Jesus alone for justification. Jesus became a curse to bring His people blessing. Joint His people today by faith. I’ll bet you can guess what point #2 is. It’s what Paul is trying to get them to do. #2. STAY BY FAITH IN CHRIST. Don’t move from the gospel. Don’t try to add anything to grace. Don’t allow yourself to be betwitched. Don’t get taken in by another gospel. So many people think they can move on past the gospel of grace. They turn to something else, often while still thinking of themselves as Christians! Stay awake to the gospel of grace. And don’t deviate from it. Any other way is cursed! #3. SHARE YOUR FAITH IN CHRIST. Be like Paul in verse 1 and clearly portray Jesus Christ as crucified. That’s what our church is all about. We exist to glorify God by bringing people into a life-changing relationship with Jesus Christ and Him crucified. Tell other people about Him. What He went through for us?! And we can’t bring ourselves to tell other people about Him? #4. STAND UP FOR FAITH IN CHRIST. Don’t be afraid to confront false gospels when you have to. I chickened out this week. I was in a social setting where the gospel was probably at stake, and I didn’t compromise, but I also didn’t speak up. I couldn’t figure out what to say. I just sat there with my head down and my brow furrowed. I normally had a lot of words, but I didn’t right then. But I just shook my head, “No,” at one point when asked a question and waited for the moment to pass. And then I had to preach this passage. When Martin Luther was called before the gathering of church leaders at Wurms, he was asked to recant (to repent of) his gospel of grace. He was given time to consider his response. And he was shaking in his boots. Sometimes Luther was bold, but this was a big deal. He probably could have lost everything, including his life. All he had to do was say he was wrong. But Luther believed that he had correctly understood what Paul had taught the Galatians. And I want to be more like Paul who cared enough about these churches to light into them when they threatened to careen off the cliff. “Don’t go there! Don’t leave the gospel of grace! Don’t be a fool! Every other gospel leads to cursing. But faith in Jesus leads to blessing. The blessings given to Abraham. The blessings of justification. And the blessing of having the Holy Spirit of God. Let’s stand up for that. 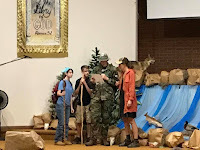 Timothy George on "Hot Orthodoxy"
Today at our Family Bible Week Finale, the skit was about a geocaching family who discovered a cache hidden on our campus. Inside the container was a letter from me which they read as part of the drama. And then during the Finale Picnic, we had a presentation on geocaching by a real-life couple who do geocaching as a hobby. They told us about their experiences and then led groups of students around our campus finding small items they had temporarily hidden for them to find using a GPS. And then we hid a bona-fide long-term geocache on our campus for hobbiests to find. And we put a copy of the letter in it. It will be neat to hear if people find it. I'll be praying for folks who are on the hunt. Congratulations! You found our stashed cache at Lanse Evangelical Free Church! I hope it was a fun challenge for you to find it. We’re glad you’re here on our campus. Did you know that God is also Someone who hunts for hidden items? Sometime when you have a chance, read the Gospel of Luke chapter 15 where Jesus tells 3 stories about desperate searches. Each search (for a lost sheep, a lost coin, and two lost sons) reveals to us a picture of the heart of God. God is on the hunt for people like you and me who have lost their way in life (the Bible calls that “sin,” read Romans 3:23, 5:8, & 6:23 to learn more). And when those lost people get found, there is a big party. Jesus says about one of those celebrations, “In the same way, I tell you, there is rejoicing in the presence of the angels of God over one sinner who repents” (Luke 15:10). Here’s how we get found: We find Jesus Christ as our biggest treasure in life. Jesus is God’s own Son who lived a perfect life, died on a cross to pay for our sin, and then came back to life to give us life (read John 3:16 to find out more). A Person like that deserves all of our trust and worship! Have you trusted Jesus as your King and Rescuer? He invites you to seek Him today. That’s what our church is all about–helping people to find Jesus Christ as their greatest treasure. We’d love it if we could help you move one step closer to Him. The coordinates are in the Bible. Navigate to Romans 10:9-10! 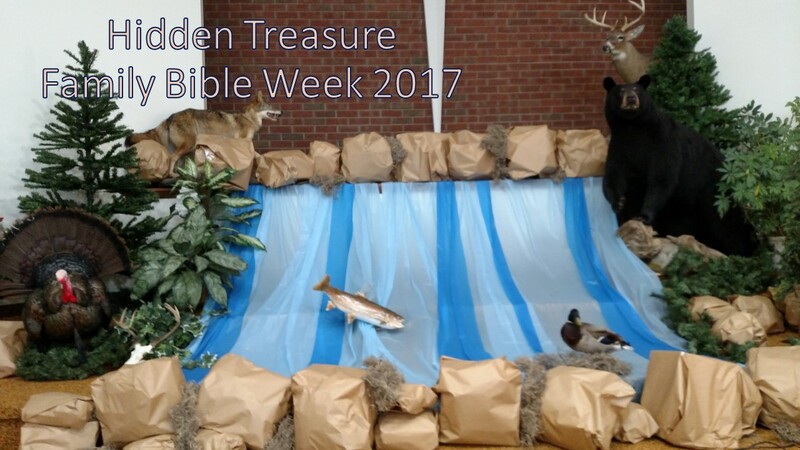 [Matt's Messages] "Hidden Treasure - Family Bible Week 2017"
As you can tell, we’ve had a great Family Bible Week. Lots of good food, good fun, good fellowship, and a really good time the Word of God. Every single one of our classes, including the teens and adults, have spent the week studying some of the greatest short stories ever told in human history. The Parables of Jesus Christ. The kids back there are studying their fifth and last parable right now. Jesus’ parables are earthly stories with a heavenly meaning, that is to say Jesus told these stories to illustrate spiritual truth. They aren’t just nice stories, but stories with punch. Imagine being in the audience when Jesus told His parables. There you are just listening to Jesus tell an engaging story, and then all of sudden, you realize that the story is about you! Jesus was the greatest storyteller in history, but he didn’t just entertain with his stories–he grabbed his listeners and turned them upside down...with his stories! When was the last time you heard a great story that pushed you in a new direction? Well, in our verse for today, Matthew 13:44, Jesus tells a very short story. A very short story! In the Greek, it’s just one sentence. In most of our English versions it’s just 2 sentences. In fact, I believe it’s the earliest known story about geo-caching. Or maybe not. But it is about hidden treasure. Now, this may be a very short story, but Jesus packs an awful lot in there. Our adult class learned this week that the Kingdom of Heaven or the Kingdom of God (same thing) was Jesus’ favorite topic to teach on. Whenever He got a chance to teach, Jesus was always teaching on the Kingdom of God–the righteous rule of the rightful King over His redeemed people and His restored realm. The Kingdom of Heaven. Has the kingdom come already? The kingdom has come because the King has come. Jesus Himself. And yet, the kingdom has not yet come in its fullness. This is not as good as it gets. But Jesus taught that the Kingdom will come when the King returns. And we’re supposed to be ready for it. Next question. Is the kingdom big or small? It starts out small (mustard seed, anyone? ), but it will one day cover the world! Next question. Is the kingdom somber or joyful? It’s joyful to the ultimate degree. We saw in the parables this week incredible joy when someone found the kingdom. When someone was found in the kingdom. The kingdom is a party! Question. Who is welcome in the kingdom? Who are the citizens of the kingdom? Surprising Answer: Sinners who repent. The citizens of the kingdom are those who have been rebels against the King but lay down their arms and accept His gift of amnesty, His gift of forgiveness. Not people who think they are worthy of the kingdom, but those who know they are not. The kingdom is so surprising. No wonder Jesus loved to talk about it. That’s where we got our theme for Family Bible Week this year. Jesus is unearthing spiritual truth after spiritual truth about the Kingdom of God. And we get to listen and learn! Now, let’s look specifically at the story of the kingdom that Jesus tells in verse 44. A treasure is hidden in a field. A man finds it in the field. The man (like a good geo-cacher) hides it again in the field. The man sells his stuff and buys the field. Now, isn’t that an incredible short story? There is so much in there. It’s got buried treasure in it. It’s a got a very surprised and very happy man. It’s got a twist at the end. So, let’s ask our adult class what is the first thing that we should look for to interpret this parable? What things in the story correspond to what things outside the story in real life? And we learned this week that not every detail in a story directly relates to something outside the story in real life. It’s easy to go wrong if you try to get too many details to match up. That’s now how these stories of Jesus work. Well, we know that the kingdom is like treasure hidden in a field. That does mean that the pearl-seeking merchant himself is the kingdom of heaven. The phrase is basically saying that the “reality of the kingdom” is like this story I’m now about to tell you about. But in the case of verse 44, I think it’s actually a direct correspondence. The kingdom itself is like the treasure. Hidden, yes. And valuable. So incredibly valuable. The hiddenness of the kingdom is present throughout this chapter. Our adult class learned a lot about context this week, and the hidden nature of the kingdom is a theme throughout the context of this chapter. It can be easily missed. And then the emphasis here in verse 44 is on how valuable that hidden treasure really is. What do think the field is in this story? Earlier in the chapter, there is another field in another parable. So do you think the field here in verse 44 is the world? No. We learned this week that the correspondences in one parable do not automatically port to another parable. No, I think the field in this story is just a field in this story. Who is the man in the story in a real life? What is his external referent? I’m not sure that he really has one. In a story so short, I don’t know that the man has to have a corresponding reality. Some people have thought that the man is Jesus Christ Himself. And that is a remote possibility. In that case, the parable is teaching the truth that “for the joy set before Him, Jesus endured the Cross.” Jesus gave His all, His precious blood to purchase the Kingdom to give it to us. And that is certainly true. He sure did. But I don’t think that’s what this parable is talking about. I think that’s looking for too much correspondence. I think the point of the parable is simply that kingdom is supremely valuable. The Kingdom of God is worth everything. Because that’s the kicker, isn’t it? I mean there isn’t much time in this story for there to be a twist, but what a surprise ending?! Verse 44 again. That’s a twist, isn’t it? Do you own a car or two, a house? Do you own some land? Do you have something in your wallet? Do you have something in storage? Do you have some things in your closet? Now, imagine liquidating all of that. You go to the bank, and you withdraw all of your money. You sell your house, your vehicles, you cash in your retirement plan. You put every single thing you have into one cashier's check, and you go to the realtor’s office, and you put it down on that one field. You slide all of the chips you have across the table for that one field. Because it has that one treasure that’s worth it all! Do you see the joy there? This guy is so overjoyed to get this treasure for himself. He has hit the jackpot. He has won the lottery without even playing it! The kingdom of heaven is worth absolutely everything. It’s worth jumping at the chance to get no matter what it costs. Now, I think we could also go wrong in thinking that we can somehow buy the kingdom. If we give enough money. If we just give away all of our money, we can buy the kingdom. But I don’t think we’re the man in the story either. I don’t think Jesus is the man. I don’t think the disciples are the man. I don’t think we are the man. This parable is not teaching us HOW to find the kingdom. It’s teaching us that the kingdom is supremely valuable. The kingdom is worth everything. Absolutely everything. And one other way we can go wrong is by getting stuck on the ethics of the man in the story. Anybody feel that question as we read it? I mean was this ethical for him to do that? I understand that he didn’t lift the treasure. He didn’t steal it. He didn’t find it and run home with it. He just put it back where he found it and then bought the whole the field so that it was unquestionably his. What he did was probably legal. But I wouldn’t want somebody to do that to me! What do you think, class? I think it’s not the point. Jesus isn’t teaching ethics here. He does elsewhere. The other night, we studied the parable of the Shrewd and Dishonest[!] Manager. He was not commended for being dishonest, just for looking ahead and exhibiting shrewdness. Jesus is not necessarily commending this course of action. He’s just showing how much this treasure was worth to this man. The kingdom is worth whatever it takes! The merchant, he had found the be-all-and-end all of pearls. And he was willing to part with every other thing he had of value to gain that pearl. That’s it! That’s what this story is teaching. The kingdom of heaven is supremely valuable. It’s worth risking anything and everything to possess! Is the kingdom this valuable to you and me? And you know what makes the kingdom so valuable? It’s the King, of course. It’s the Kingdom of Christ! Is the King and His Kingdom this valuable to you and me? No, we don’t buy it. We never could. We couldn’t rub together enough money to earn this kingdom. That’s what we’re learning in Galatians, isn’t it? We get into the kingdom by grace through faith. Paul gave up everything He had to gain Christ. Because everything He had was nothing. Christ Jesus is the only thing worth everything! Is the King and His Kingdom worth everything to you? If the King and His Kingdom was this valuable to you, what would change? What would change in your priorities? What would change in how you spend your time? What would change in how you spend your money? What would change in how you worship? What would change in you work? If the kingdom is worth everything to you and me, what needs to change to reflect that? What needs to change in your life to reflect the fact that you have found the be-all-and-end-all? The pearl of greatest price. The treasure that relativizes all treasures. Is there a sin that needs confessed and repented of? Is there some forgiveness that needs to be granted? Is there a shifting of your time or money or some other thing you need to move? If Jesus and His Kingdom is worth everything, absolutely everything, then what needs to change in your life and mine? I believe that’s the question that Jesus’ story is pushing us to answer in each of our lives today. Can I ask you to do something as we close? Would you write down what you think needs to change? And would you pray to God that you will make strides by faith to change in that area this week. But he who has ears to hear, let him hear. And let him respond appropriately. [Matt's Messages] "I Live By Faith in the Son of God"
Our sermon series is called “The Truth of the Gospel” because that was what was at stake in Galatia. The Apostle Paul has written what we called a Tornado Warning Letter. He has broken the glass and sounded the alarm because these churches were on the brink of abandoning the truth of the gospel of grace. False teachers had snuck into the churches that Paul had planted on his missionary journeys and sowed false teaching, a false gospel, another gospel which really is no gospel at all. And they’ve discredited Paul as a faulty apostle, preaching a derivative and defective gospel. Derivative of Jerusalem’s apostles and defective because it doesn’t say enough about the Law of Moses. 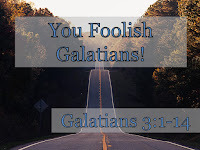 And Paul was shocked to find out that these churches had been entertaining the ideas of these false teachers, so he picks up his pen and writes them the Epistle to the Galatians. Paul uses some of the strongest language of all of his letters for this letter because he was concerned that these churches he cared so much about might flounder and sink into heresy and ruin. So for last two chapters, he’s been setting the record straight on where he got his gospel. Where did he get his gospel? Peter, James, John? No, directly from Jesus Christ. Paul wasn’t looking for the gospel, but Jesus came looking for him! But even though he didn’t get his gospel from the apostles based in Jerusalem, he had the exact same gospel as the apostles based in Jerusalem. They met once and agreed on everything central to the gospel! Peter, James, John, and Paul all had the exact same gospel. Which made it kind of awkward when the apostle Peter came up to Antioch and acted inconsistently with the truth of the gospel. That’s what we looked at last week. Peter came up to Antioch and, at first, lived up to his theological convictions of what he could eat as a Christian and who he could eat with as fellow Christians, equal in the gospel. And then...certain men from James came up and Peter all of sudden chickened out. He stopped eating with the Gentile Christians which sent the message that only those who were Jews were truly acceptable Christians. Peter didn’t say that in so many words, but that’s the message that was being conveyed. So Paul opposed him to his face. He called Peter out in public. Remember this? “You are a Jew, [Pete!] yet you live like a Gentile and not like a Jew. [And that’s okay because of your freedom in Christ. But...] How is it, then, that you force Gentiles to follow Jewish customs?” To become Jews, in essence? Now, he wasn’t saying that Peter was teaching a false gospel, but that you could get the wrong idea of what the truth of the gospel was by how Peter was acting. Peter’s life was sending the message that you had to take on the Law of Moses to be a good Christian. Last week, we read through verses 15 and 16 but we had run out of time to really dive into them. So it’s fitting that we start with them today. This section is really the heart of the letter. Paul has finally got to what he really wants to say to the Galatians. He’s finishing up the history that brings him to this point and is transitioning into the theology that desperately wants the Galatians to get. I’m not sure where the report of what he said to Peter ends and where his further reflections begin, but it doesn’t really matter. By chapter 3, he’s speaking directly to the Galatians and addressing their folly. But here he’s making his central point and waxing eloquent on what it means to be united to Jesus Christ. For the last 25 years, Galatians 2:20 has been one of my favorite Bible verses, and I’m excited that it is our new Hide the Word verse to learn together. Here’s one of those places where the Bible tell us how Jesus loves us. When I was a student at Moody Bible Institute, we had to memorize this verse for a class, and it just jumped off the pages at me. There is a mysterious connection between Jesus and me. He has identified with me, and I have identified with Him. Enough that there is something about me that no longer lives. And Jesus Christ, through the Holy Spirit, lives in me. There is still a sense in which I do live, but it’s by faith. But Galatians 2:20 doesn’t exist out there on it’s own. It was written in a certain particular contexts in a certain particular letter of Paul to the churches in Galatia. Paul says what he says in Galatians 2:20 a part a bigger point he is making, a more complex argument. I admit that the logic of a few of these verses (especially verses 17, 18, and 19, the logic of them) escapes me. I’ve read and read the commentaries, and I have a vague idea, but I’m not sure I can adequately explain them. It helped me that D.A. Carson, one of the leading evangelical Bible scholars of our day and one of my former professors at Trinity says that these are a “bit hard to understand.” I feel like I’m in good company there. And Douglas Moo, another one of my old professors from Trinity, and an amazing Bible teacher himself, has end-notes that have footnotes on these verses in his commentary! Notes on the notes! So there is some complexity here and some ambiguity on the details. But at the exact same time, the main points are simple and obvious. I’ve got two points of application for you today and they are very personal for Paul and for us. Point #1. I am justified by faith in Jesus Christ. Point #2. I am living by faith in Jesus Christ. If you’ve got that, you’ve got it all. Let me try to show you what I see here. #1. I AM JUSTIFIED BY FAITH IN JESUS CHRIST. Do you remember what it means to be justified? It means to be declared in the right. To be counted as righteous. To be recognized as right with God, possessing a right standing with God. How does one be justified before God? Paul had a lot to say about this in the book of Romans which we studied together in 2014, 2015, and the first part of 2016. How does one become justified before God? Well one way is to be perfectly righteous every second of your life. But unfortunately, there is no one else, by nature, in that category. Is there anyone here who has been perfectly righteous every second of your life? If so, I want to shake your hand. So if I can’t be justified by possessing a perfect righteousness on my own, how can I ever be? That was the question that plagued Martin Luther, a Bible teaching monk in the 16th century. He knew that God was perfectly righteous, and he knew that he himself was not, and he feared the righteousness of God. Because without being justified there will be no salvation, no eternal life, no enjoying the kingdom of God when it comes in its fullness. There will only be what we learned about in Sunday School this morning, the judgment of God. The justice of God. The full payment due for un-righteousness. You see why this letter is so important? You see the stakes? You see why Paul uses such strong language? How does a sinner become justified? Paul reminds Peter in verse 15 that they know the answer to that question. Did Paul just repeat himself? I think he said the same thing three times in a row! Paul is contrasting two different approaches to justification. One is right and one is wrong. What law is he talking about there? Well, the obvious one is the Law of Moses. The Law God gave to Moses back in the Old Testament. So the 10 commandments and the sacrificial system and the dietary restrictions and the purification laws and the civil justice code and the feasts and all of that. Signified for the newborn males by receiving the sign of circumcision in the flesh. Now, was the Law a bad thing? No, it was a wonderful gift to the people of Israel. Just putting your faith in Jesus Christ? Just putting yourself in His hands? Trusting in Who Jesus is and what Jesus has done? And then I’m declared righteous before God? I’m declared righteous BY God?! Just by faith in Christ and Christ alone? And that’s what Martin Luther rediscovered in the book of Galatians and the book of Romans back in the 16th century. And it turned the world upside down. Here’s what we know: I am justified by faith in Jesus Christ. Don’t you think we have to add some works of the Law in there? Don’t I do something? Don’t I add some good works? Don’t I clean up my act? Don’t I become a good person first? Well, that’s not what everybody thought. Paul’s enemies had an answer for that an accusation. They, apparently, said that this gospel of sheer grace makes Jesus a promoter of sin. Look at verse 17. Now, I’m not sure that I understand Paul’s logic here. There are multiple ways of construing it. My best guess for today is that he’s saying that if you trust Christ for justification and then you still end up sinning (which you still will!) then whose fault is that? The circumcision folks say that it’s all that grace that’s being thrown around. If you tell people that all you have to do is believe in Jesus, then they are going to sin, and sin and sin all the more so that grace may abound. Does that sound familiar? Like something we read about in Romans 6? People who have genuinely come to believe in Jesus Christ do not go crazy with sinning! How about you? Do you want sin a lot more now that you have trusted Christ? Yes, I know you want to sin sometimes. But do want to sin more because Jesus has been gracious to you? I don’t think so. And Paul says, even more, in verse 18. And I really don’t know what that one means! I think he’s saying that the law kills, and it killed Jesus. Because He took on the curse of the Law (we’ll read more about that in chapter 3), and when He died fulfilling the Law, you and I died to the Law. We are no longer under the Mosaic Law. And, paradoxically, now we can live for God! So, the opposite is true. I am not justified by observing the Law, but by faith in Jesus Christ. Do you see that? I’m sorry I can’t explain it better. It’s following that statement that “through the law I died to the law so that I might live for God” that Paul gives us Galatians 2:20. What a powerful way of saying it. When Jesus died, somehow, we died with Him. Now, not physically, of course. We did not take the nails that we deserved! He did. But somehow in spiritual reality, we were co-crucified with Jesus. And we are still in that state. The Greek tense here is the perfect tense. And I no longer live. The “I” that is a sinner who loves sin. The “I” that was trying to justify myself. The “I” that was an enemy of God and destined for Hell. That “I” no longer lives. Not in the most meaningful sense. That “I” still has a zombie life, of course. 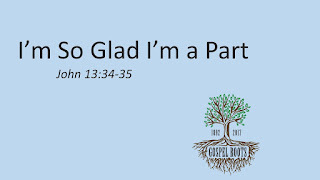 We’ll learn more about the flesh and indwelling sin when we get towards of the end of Galatians. But the old me has been rendered virtually powerless by my co-crucifixion with Jesus. And now “Christ lives in me.” I have resurrection life. I have the personal presence of the Son of God through the Spirit of God. I was not just joined to Him in His death, but I am joined to Him in His new life! So, I still live. The new “I,” the new me. #2. I AM LIVING BY FAITH IN JESUS CHRIST. This is the living dynamic at work in life. I am trusting in Jesus Christ and He is my life. I am trusting Him daily. I am trusting Him moment by moment. I have a life-changing relationship with Him. I don’t live by faith in my own good deeds. I live by faith day to day, by faith in the Son of God. Living by faith is not just nodding your head that some facts are true. It is placing yourself in the hands of Jesus and trusting your whole life and your whole eternal future to Him. It is trusting that you have been united to Christ and share in everything that He has. It means when God the Father looks at you, He sees the righteousness of His Own Son. I think that’s part of why Paul calls Jesus, “the Son of God” here. Because you and I are, by faith, united to God’s beloved Son. And He can easily say, “That person there is righteous. They are in my Son. I don’t think that you and I disappear as persons in Galatians 2:20. We are still ourselves. It’s not saying that the person of Matt Mitchell got crucified and now I’m some kind of a puppet. I’m more “myself” than I have ever been. Because I am now united to Jesus Christ. And now I am living by faith in Jesus Christ. I love that Paul uses the personal pronouns here. Jesus didn’t just love everyone. Jesus didn’t just love His chosen people. Do you see his logic? Paul is not going to budge on this gospel of grace. He will not nullify the grace of God. He will not change his tune on what gospel he preaches. He will not give in for a moment to the idea that we are justified by works of the law. Because if he did, then he would be saying that Jesus never had to die. I mean if I could get myself justified by simply obeying the Mosaic Law, then why did Jesus have to die? He didn’t. I could have just done it on my own! How insulting that is to Jesus! I will not set aside the grace of God. The application is obvious, I hope. I know that all of this is familiar to you. At least, I hope it’s familiar to you! This is the gospel that we are trying to preach here at Lanse Free Church. This is the message that we are going to give each day to the children, youth, and adults that come to Family Bible Week. So, I hope it’s familiar. Most people think that the gospel is about being a good person. Go down to the Pumpkin House or Key Largo and do a survey. Ask them what it takes to be justified before God. Those are all good things to do. You’ve got trust in Jesus Christ. You’ve got to trust in what He did on the Cross when He loved you and gave Himself for you. Be justified by placing your faith in Jesus Christ. And then live that faith every single day. Because when you believe in Jesus, everything changes. Your relationship with the Law. Your relationship with God. You can now live for God! Because you have been crucified with Christ and no longer live, but Christ lives in you. The life you now live in the body, LIVE BY FAITH in the Son of God who loved you and gave Himself for you. 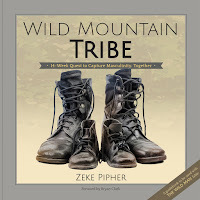 I'm pleased to announce that Todd Dobo has won a signed copy of The Wild Man and Wild Mountain Tribe by Zeke Pipher! Congratulations, Todd. I look forward to hearing how the Lord uses them in you and your boys' lives. Thank you, everyone who participated! If you want to buy your own set, visit the Wild Mountain to order your own copy of The Wild Man and/or Wild Mountain Tribe today! Read my interview with Zeke about these two books. Read my list of the 5 biggest things I appreciate about these "wild" books. And watch the video about them below. 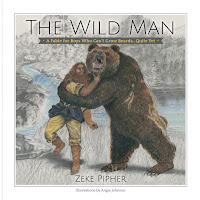 All this week, I’ve been promoting The Wild Man fable and Wild Mountain Tribe by Zeke Pipher [read our interview here]. In fact, I’m giving away a signed set tomorrow morning (enter by 11:59 tonight!). I’m pleased to do this because I applaud what Zeke is trying to do with these new resources for followers of Jesus Christ. 1. In writing The Wild Man and Wild Mountain Tribe, Zeke is doing his part to raise up godly men. 2. Zeke’s books are a valiant attempt at capturing masculinity. It’s also hard to get the message of manhood right. Not only does the world offer many false and twisted versions of masculinity, but even when you’re trying to be biblical, there are various extremes that are tempting to fall into. I’m glad that Zeke has taken up the challenge of leading the expedition through the minefield. I love that he calls it the “quest to capture masculinity.” We won’t get everything right, but we are aiming in the right direction. And we’re doing it together. 3. Zeke knows that masculinity is not one-size-fits all. People who write about manhood often try to pigeonhole all men into one mold. But God didn’t make us that way. He’s much more creative than that! I get frustrated when I read books on biblical masculinity that miss out on the inventive and diverse variations of faithful godly masculinity that are possible. Not all men look or act the same. And a lot of what we think is “masculine” is actually just culturally condition preferences. Zeke gets that. So while his main characters in the fable do some “traditionally” manly things like hunting, fishing, or sleeping outdoors, he is also careful to not stereotype, especially in the guidebook. In The Wild Man fable, masculinity is represented by hair and physical strength. However, you do not need to have a beard or large biceps to be masculine. Many of the young men who read The Wild Man and Wild Mountain Tribe are several years away from being able to grow facial hair or bench press impressive weights. Likewise, many of the older men who read these books have lost the thick hair and physical abilities of their youth. Neither situation limits a man’s opportunity to be wild. Many authors and speakers have reduced the definition of masculinity down to haircuts, clothing styles, and physical accomplishments. This narrow, external-focused explanation of masculinity pushes many of our manliest men out of the category, and that is a sad loss. To be masculine is to carry the right vision, do the right things, and follow the right King. Being masculine does involve being strong, but strength takes many forms. For this reason, the fraternity of wild men is varied, abundant, and multi-sided. You will find that it has plenty of room for your style, abilities, and skill-set as a man. 4. Zeke’s vision of manhood is biblical, not cultural. Another way of saying this is that the vision of manhood that Zeke is developing and promoting is biblical, not cultural. If it’s not about being a one-size-fits-all kind of man, what kind of man is Zeke trying to get us to be? Look at the list of manly virtues that Wild Mountain tribes will discuss when they get together and you will find a very counter-cultural set of values, including grace, honesty, humility, self-control, responsibility, proactiveness, protectiveness, courage, faithfulness, wisdom, discipline, submissiveness. Oh, what the Lord could do with a generation of men like that! 5. Zeke’s vision is the raising up of a generation (or more!) of wild, but not savage, men. To tell you the truth, I was not “wild” about the adjective Zeke used to sum up his project. First, Zeke reminds me that God Himself is not domesticated. In the words of C.S. Lewis about his stories’ Christ-figure, Aslan is not a “tame Lion.” He is not safe, but He’s good. Second, Zeke paints a picture of what “wild” means in the context of his fable and the guidebook, and it’s really good. I want to be like Zeke’s Ancient Man and Wild Man. They may seem scary at first, but I actually want men like that around me and walking with me through life. If that’s “wild,” then sign me up! And third, Zeke explains in the very first week of Wild Mountain Tribe the difference between being savage men “brutish, rude, and cruel” with being wild men “powerful, and even at times fierce, but they are always kind and self-controlled” (pgs. 17-18). That contrast was really helpful for understanding what Zeke was trying to convey.